Submit key serve as link for user to submit their data to database. 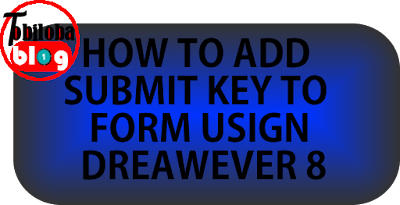 The key to the form (obtained using the Submit Setup Tool For Web Page Forms at www/smart/guide/webpageforms) must be placed within a hidden text box beside the Submit Button. 1.Click on the Insert Hidden Field icon in the Forms Objects Panel (or select Insert, Form Objects, Hidden Field from the menu). 2.Right click inside the text box and select Properties from the menu, if the Property Inspector is not already opened. 3.Enter 'recipient' as the name for the hidden text box. 4.Enter your key value for this form in the Value box. It should now display on your Dreamweaver screen as a hidden field marker . But the hidden field will be invisible once the page is loaded in the browser.